Waterfowling's much more special when shared with family. Dark was with us and the howling wind tugged at the cloth blind tucked into a windrow of cedar trees on the edge of a cut barley field. The rain would also come and the storm clouds would snuff the sun. Gathered in the blind was our granddaughter Tiffany Holladay, whom I affectionately call Tiff, my wife Renette, our host Eric Wagner, and myself. Tiff in a pre-dawn duck blind listening for the sound of thin wings slicing the air. We were on Prince Edward Island, Canada, during that season of the year when summer's greenery turns to autumn's flame on this resplendent island with its rolling hills, flat farmland, laced with creeks, ponds, rivers, beaver ponds and all bordered by salt marsh where the smell of the ocean is strong. A most perfect place for black ducks. A waterfowler's playground. The last bastion where you can shoot four of these grand Atlantic Flyway ducks. But it is also within my memory when I could shoot four black ducks in my home state of South Carolina. The limit is now one. This story began on July 7, 1988 when Tiff was born. I had been fishing that sweaty, summer morning for bream and was scaling them when I got the call that a second girl, the baby wasn't scheduled to be born for another week, had been birthed by my daughter. I stopped long enough to brush fish scales from my beard, my short-sleeved faded khaki shirt and hurried to the hospital. She had blonde hair and sharp, glistening hazel eyes that you could look into forever. I had no idea that she would become a huntress and ducks would be her favorite game. As she grew older we fished and I soon learned that she had a talent--a skill for the outdoor way of life. Her mind even at an early age was a compass. When she was nine, she came to me and asked me to take her duck hunting. I talked her into waiting a couple of years. I gave her videos on waterfowling hunting and I watched as her interest rose. She was serious about wanting to be a duck hunter. Her waterfowl identification soared. When Tiff turned 11, she again came to me and said, "Let's go." It was time for me to ante up. She had shot some doves with me and so I knew she was versed in gun safety and some shooting dexterity. Tiff and the author sharing some down time. My wife and I had hunted at Ace Cullum's Pin Oak Mallard Lodge, now privately owned, near Rayville, Louisiana, in the late '90s and had banged mallards for three days. This seemed as good a place as any to put her on some big-time duck hunting and to jump start her with ducks and memories. 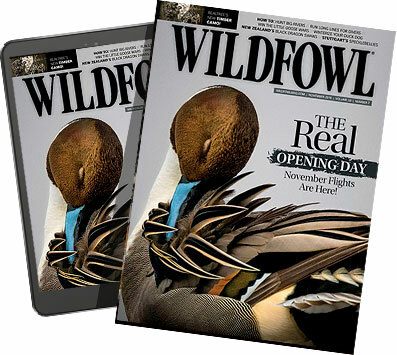 "The mallard count is down," Ace said when we arrived at the Lodge only days away from the year 2000, "but the gadwalls are here in large numbers." The mallards were still to the north where warm weather continued to restrain them from slipping south. The first morning in a green timber off-the-water blind I peered into Tiff's hazel eyes as I had done the very first moment I saw her and in them I saw her mother, who as a young girl was my woods shadow. And now my second granddaughter wanted to walk with me on a natural thoroughfare. The blind we hunted was named the "Sweet Hole," where 33 consecutive mallard limits were taken during the 1996-97 waterfowl season. A length of time passed without a note. It seemed that everything had been put to bed with a shovel when the weather abruptly changed and we were served an icy wind. Tiff coughed. A cold had climbed upon her small shoulders. I had asked her to wait a day before going out, but she would have none of that. She came to duck hunt. As the thermometer began to plunge, she began to suffer even though she was properly clothed. She had never faced bitter weather common to cold climate waterfowlers. Time passed and in a whisper she said to me as not to show weakness, "I don't have any feeling in my toes." "Try moving them back and forth," I said in a soft voice. "I'll try." Birds were beginning to build out at about 100 yards. Mostly gadwalls and a few mallards. Perhaps this activity and getting in a few shots would warm her up. It didn't. Her interest began to dwindle. She was only 11. "I'm cold. I really am," she said somewhat apologetically. Tiff was in great discomfort. To insist she remain in misery would kill her spirit. She was far too valuable to let slip through the cracks, for I had watched her sup on every small moment. I asked Stuart to take her and my wife back to the lodge where Tiff could warm by the fireplace and sip hot chocolate. While they were gone, I got in a flock of mallards and killed a drake. I could've taken more but I didn't. I didn't want to shame her. That afternoon when the sun was about to settle, she asked, "Do you think I'll get a duck tomorrow?" "I hope so. But if you don't, just remember you've got plenty of time." I didn't load up the next day so as not to be in competition. She got several shots at gadwalls but only feathers floated. Yet I could tell she would never quit, for I knew for certain that Tiff had feathers and bills in her bones. Sadly Tiff did not get a duck on her first real duck hunt. Taking a knee with a string of black ducks. eam and bass in ponds around home in the spring and summer. My traveling saw me gone for most of the waterfowl season and another duck hunt seemed impossible to arrange. Then she started dating and I always told her not to date any boy unless his daddy had a place to shoot ducks. So far she has not heeded my advice. But she has made sure that any young man she dates likes to duck hunt. As time neared for her to finish high school, I told her that before she began whatever it was that she wanted to do in life, that I was going to take her on a black duck hunt on Canada's Prince Edward Island for her graduation present. I could not have presented her with a finer gift. Throughout the summer we stayed on the phone chatting about guns and shells and what type of clothes we would have to pack. My excitement for this sport has never waned and it makes no difference whether I'm off to some exotic land or to shoot a wood duck in a nearby swamp close to home. It is my passion. It is my life. It is my undoing. Now we were all together again and Tiff was ready to take on whatever the weather pitched to her. It was only two weeks before we left home for Prince Edward Island that she killed her first whitetail buck with a rifle. A hefty six-pointer. However, she is quick to say that her first two deer were killed when they collided with her truck. Before leaving home, Tiff wanted to know if these faraway people spoke English. After a day on the island, she said, "They sound just like us, 'cept they don't have no Southern drawl." Before Tiff came, this field we were hunting was only a piece of ground of no consequence. No name. Its duty was to grow crops and feed black ducks. This was about to change. The sun that had greeted us when we arrived on the island with its doll house scenery was no more. The weather had turned frightfully awful. A duck hunter's climate. In the vagueness of day's first light I could see her bushy blonde pony tail protruding from the back of her cap. She was intense and ready for black ducks to rush into the decoys. Her right trigger finger rubbing ever-so-softly the safety on her 12-gauge semi-automatic shotgun. A light rain began. The wind continued to build. From our blind we could hear black ducks out in the marsh waking-up to leave the water to feed in the fields and then return to their watery homes to preen and to rest on this dreary morning. Girl raised in the South. Our wait was not long, a flock of maybe 30 black ducks came through the gray and the rain and the cold and into the decoys on rigid, inward wings. It was the most black ducks I had seen in a single flock in years. Guns fired. Their echos went across the field out into the bay and into eternity. Three black ducks dropped from the rank and file. We each had knotted a duck. It was not only Tiff's first black duck kill, but the first time she had ever seen one. Now it was Belle's time and she left the blind in her own special kind of rush. Her moist-black twin nostrils sucking in odors she had never smelled in this strange and unknown land &apos;¦save for ducks. Her large head dipped and when it lifted there was a black duck between her jaws. Warm, wonderful feathers. Her nose buried deep in scent. Twice more she hunted down her quarry. I felt many things as I watched Belle release Tiff's black duck into her open hand. Most of them I cannot explain&apos;¦not even in words. But I did recognize pride. And I witnessed her smile and saw the brightness in her youthful hazel eyes. A memory she will take into old age. She had done well. Later in the morning a cripple spiraled down from another flock. Belle trailed the elusive bird across the field scooping it up in full gait. Her joy. Her breeding. Eric, mystified by this young girl who didn't mind sitting in a cold rain to shoot ducks, said, "What kind of a girl are you!" "I'm a G.R.I.T.S. girl!" she exclaimed. "Girl raised in the South!" "Tiff," he said, "we want you to go back to South Carolina and bring back a bus load of girls just like you to our island." Tiff would kill some more black ducks before the three-day hunt ended, and on the morning of the fourth day, Eric came by to say his good-byes. To Tiff he said, "I'm going to name the field we hunted The G.R.I.T.S. Field." A wide smile tracked her face. Editor's note: For more information contact Eric Wagner eric@wagnercottage.com Or call (902) 831-3079.